Are you looking for a moment out of the usual typical-kind of party where they blast loud music and people just drink and dance? You might want to be part of this big and significant event happening this entire January—one of the grandest festivals in the Philippines: Cebu’s Sinulog Festival. Just when you think parties and noises are over as Christmas season ends, Sinulog will make it even more fun and noisier as January begins. The Sinulog Festival is held annually every third Sunday of January marking the influence of Ferdinand Magellan as he introduced Christianity through the image of the child Jesus, Santo Nino, in Cebu City. Traditionally, the celebration only lasts for 9 days where Sinulog Grand Parade, the main highlight of the festival happens on the final day. However, with its transition, evolution occurred making it a month-long tradition in Cebu. It’s crazy! It’s epic! And it’s fun! This is how Daniel Marsh, Wil and Haley Dasovich, the popular YouTuber’s and most of the foreigners who set foot in Cebu describe their Sinulog experience. It has become more exciting as the festival becomes more and more commercialized wherein it now includes events such as contests, beauty pageants, art exhibits, fun run and after-parade party celebration. Thus, making the Sinulog festival more popular and well-known not only in the Philippines but around the globe. It’s so popular that millions of people flock to this occasion every year. 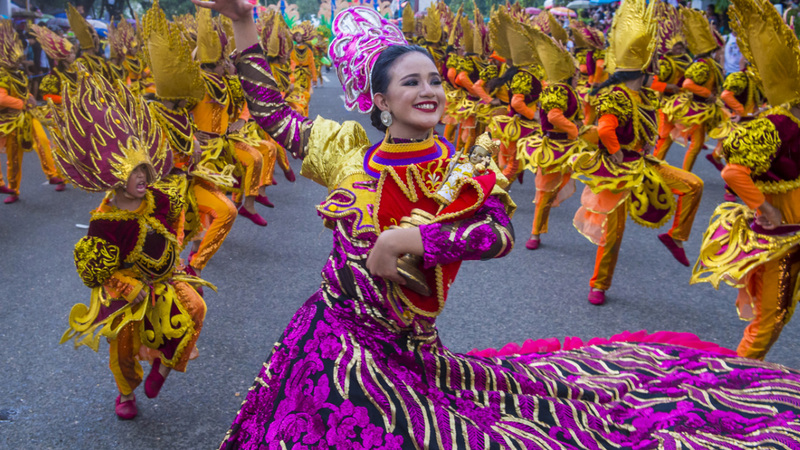 The festival entails two major activities, the Fluvial Parade and the Sinulog Grand Parade. Fluvial Parade is a procession of a ceremonial galleon bearing the image of Sto. Nino and the Virgin of Guadalupe along with hundreds of sea vessels in commemorating the coming of Sto. Nino’s image from the Spaniards centuries ago. It serves as an attraction to many tourists for each boat is designed with colorful bunting banners, balloons, flags and flowers that compliments to the bluish color of the Mactan ocean. Moving on to the most anticipated and to what they call the soul of Sinulog, Sinulog Grand Parade— it’s basically their traditional way of telling the story of their religious transition in accepting Christianity through a long procession of several dancing groups performing the Sinulog dance, a simple forward and backward dance that represents the current (sulog) of a river in Cebu. Recently, it has been promoted as a tourist attraction where contests are not only participated by the Cebuano’s itself, but it also features contingents from various parts of the Philippines. Your tongue will never get dry with Cebuano’s foods and delicacies isolated in a buffet-like style around the area.